Johannes Conrad (John) Trüber was born in Norka, Russia on September 4, 1855 the son of Conrad Trüber (born April 16, 1819) and Sophia Brill (born November 8, 1818 and died November 21, 1891 in Norka). Johannes Conrad was confirmed in Norka in 1871 and married Anna Maria Vögler on February 11, 1875. ​Anna Maria was born August 20, 1854 in Norka, the daughter of Heinrich Vögler (born 1825) and Christina Lehl (born 1828). Anna Maria was confirmed in 1870. Anna Maria gave birth to at least three daughters in Norka between and all of them died at an early age. A son, Johannes Adam, was born in Norka on February 1, 1877. Two more sons: Johann Nicolaus, known as George, (born April 13, 1889) and Johann Wilhelm (born December 26, 1891), known as John, were born Norka. Johannes Conrad's family, along with his father, immigrated to the United States early in 1892, departing from Hamburg, Germany on March 15, 1892 and arriving in Baltimore aboard the steamship Bohemia on April 2nd. The passenger manifest indicates that they are bound for Oregon. Johannes Conrad (now John) and his family were to reunite with his sister Sophia who married Conrad Schwartz (they arrived in 1884), and his brother, Johann Wilhelm Trüber (John W. Treber) who had arrived in Portland by early 1888. John and Anna Maria were founding members of the Ebenezer German Congregational Church which was established in 1892. In 1900, John's sister Margaretha arrived from Russia with her husband Johann Georg Urbach. John's father, Conrad, died in Portland on April 25, 1904 and was buried at the Lone Fir Cemetery. Anna Maria died in 1932 was buried at the Rose City Cemetery. 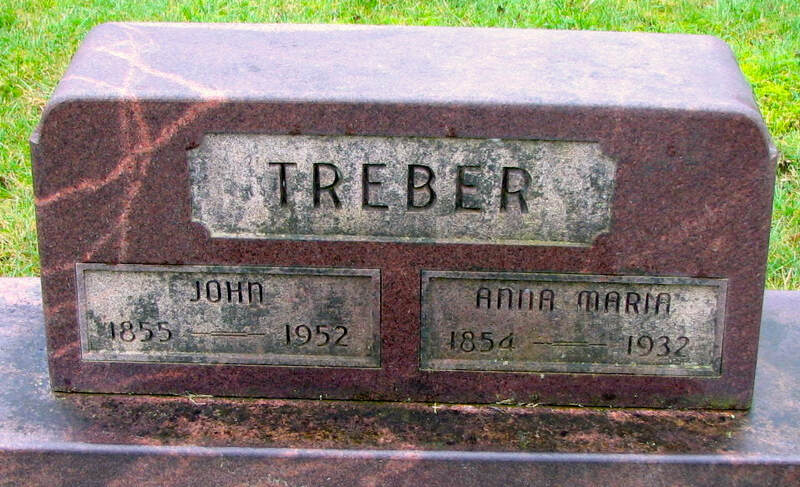 John died May 9, 1952 in Portland and was buried at Rose City Cemetery with Anna Maria. Krieger, Joanne, trans. Ebenezer Congregational Church, Portland, Oregon 1892-1908. Portland, OR: n.p., 1999. 28-29. Print.